Ahh! Ok…but still, they could have chosen some art that's closer to what the character actually looks like. 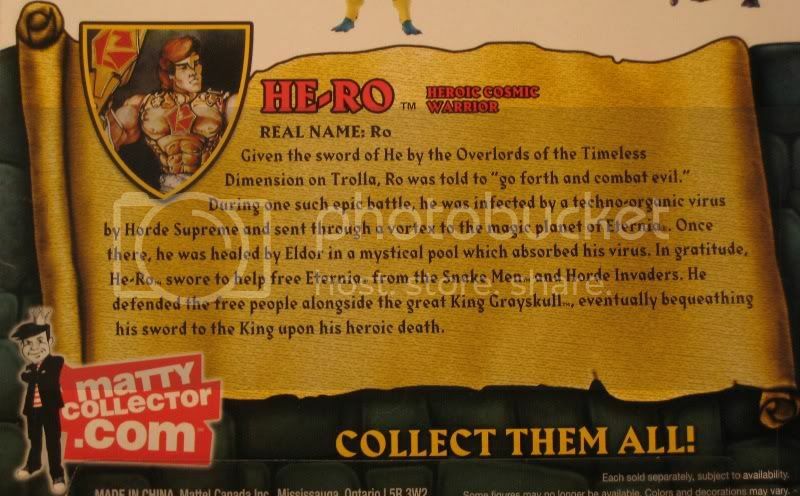 Keeping what you've said in mind and keeping this new "story line" that Mattel is creating in mind…why would He-Ro have a weapon on it with Grayskull's initial? ESPECIALLY if he's the first to have the "power" granted to him. According to the bio, He-Ro passes the power sword on to Grayskull. Nice to see some pictures and a review. I'm hoping Mattel will be sending out official review samples, though. I can't wait to give my review! Good God people, let Val and Emiliano write the remainder of the Bios. I agree completely. The stuff coming out on these bios is getting laughable, really, which is why I'm totally ignoring them now. I just hope they don't use this as a template for a new toon or storyline down the road. As far as the "G" goes, I always assumed that stood for Grayskull, not Gray. Since he was to transform from Gray to He-Ro in the old story, I was under the impression he had a dual identity like Adam. A great review for the figure. As far as the controversy mentioned, I'm in the camp that's glad they left the ab crunch exposed and functional. If both the chest and abdomen are painted to match, I don't see the problem. Take off the armor and it looks like he's wearing an undershirt. I'm still very happy with the way the figure turned out. It was worth waiting 20 plus years to get this character done this well. Just wanted to note my agreement with this statement too. I know it won't happen unfortunately, but if it did I think things would be so much better. I love Val and Emiliano, but I'd like to seem them team up with someone who doesn't know anything about MOTU to co-write the bios. I think combining someone with a fresh take and tempering it with their knowledge and instinct would give us the best mythos for MOTUC. I really dont pay any attention to all the new Bio's. I take into account all canons of MOTU mytho's and make my own Timeline and Storyline. He-Ro will be Gray and his sword will be the Sword of Eternia. To Defend and Protect all Evil that fills the lands of Eternia.